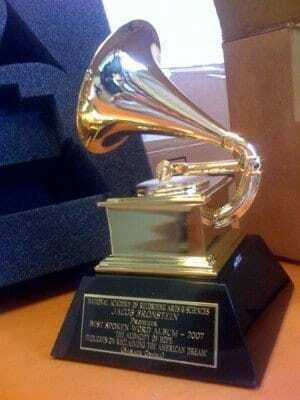 The 2012 Grammy Awards were dominated by British singer Adele. The singer took home six Grammy Awards last night, winning in every category she was nominated in. The 23-year-old also set a new record for youngest artist to take home the “Big Three” – Record and Song of the Year for “Rolling in the Deep” and Album of the Year for “21.” Adele was named Best New Artist at the Grammy Awards two years ago. Keeping up with the trends, this year the Grammys 2012 show included electronic dance music (EDM) for the first time. Dubstep artist Skrillex (Sonny Moore) won three of the five awards he was nominated for. Another electronic artist, deadmau5, played a prank on Skrillex by showing up to the Grammy Awards sporting a t-shirt with Skrillex’s phone number and the phrase “U Mad Bro?” underneath. Later, he performed with the Foo Fighters in a collaboration of rock and EDM. Newcomer Bon Iver triumphed over rapper Nicki Minage and country trio The Band Perry for Best New Artist. Clearly shocked, lead singer Justin Vernon made a sincere and awkward acceptance speech after winning Best New Artist. The Indie folk band also won the award for Best Alternative Music Album. The band declined to perform at the award show, but Minaj performed her new single “Roman Holiday,” while performing a baffling sort of exorcism in the show’s final act. Noticeably absent from the award show was rapper Kanye West, who won four awards, including Best Rap Album for “My Beautiful Dark Twisted Fantasy,” but oddly he did not show up to receive them.